07 Dec 2018 --- Persona, a personalized nutrition platform, has launched Vitamin Packs Pro, a portal for nutritional assessment and dietary supplement analysis. The new portal enables healthcare practitioners to quickly cross-reference and assess over 650 prescription medications to gain insights into how to avoid drug-nutrient interactions, according to the company. 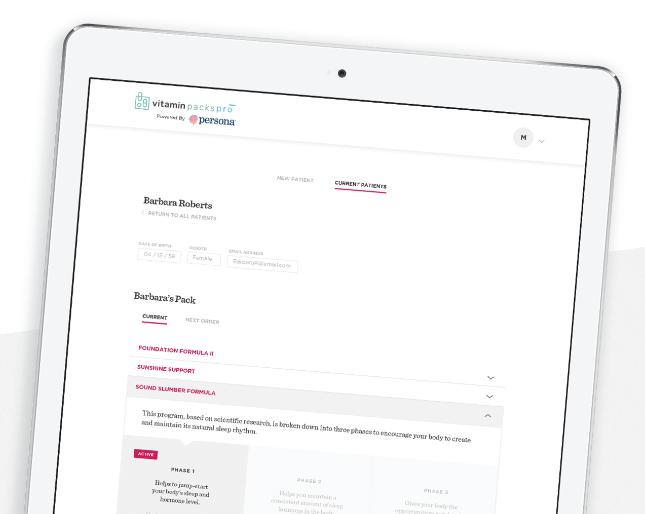 The new Vitamin Packs Pro portal offers a holistic approach to nutrition and vitamin recommendations by combining physician visits with diet monitoring and supplementation assessment. Vitamin Packs Pro portal offers a holistic approach to nutrition and vitamin recommendations by combining physician visits with diet monitoring and supplementation assessment. “Vitamin Packs Pro has two modes. One that is led by patients and overseen by physicians. Patients complete Persona’s typical nutritional assessment that uses its proprietary algorithm, which factors individual needs, lifestyle and prescription recommendations to deliver one of five trillion different combinations,” says Brown. “The second is a prescription pad feature – providing physicians the ability to use Persona’s recommendation but customize it or create a completely original plan,” explains Brown. Developed in collaboration with Dr. Roizen, Persona's proprietary algorithm assesses data about lifestyle and nutrition habits, while examining more than 650 potential medication interactions to suggest supplementation that is personalized for every patient. Developing two independent modes in one portal, that both retain Persona’s intuitive nutritional assessment, including the drug-nutrient interaction interface, was “a new challenge,” says Brown. Click to EnlargePractitioners log into a personalized dashboard to guide patients through Persona's nutritional assessment. The company says it is looking to come up with “innovative ways” to share information and “expand touchpoints” to its consumers, to make personalized nutrition easier to access and comprehend. 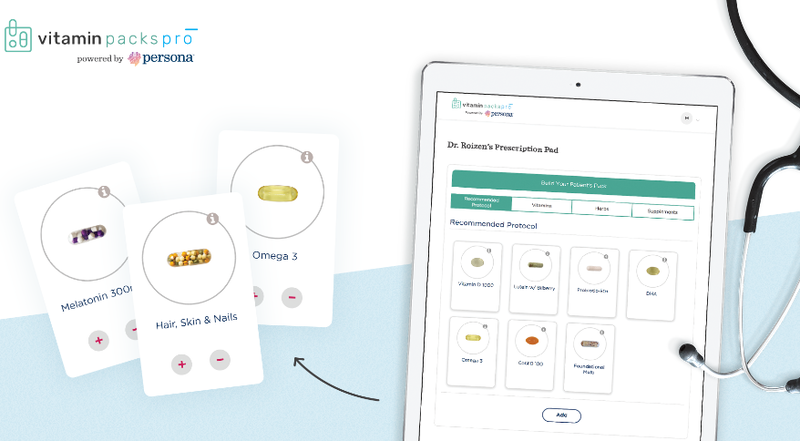 Practitioners log into a personalized dashboard to guide patients through Persona's nutritional assessment or input custom vitamin and supplement recommendations via a Prescription Pad app. Both modes retain Persona's unique drug-nutrient interaction identification. “Physicians must register for a unique account set up. Upon registering, they create a unique username and log-in to retain the highest levels of privacy for their patients,” adds Brown. Persona claims to be is the only vitamin subscription service that asks about medication use to help identify possible drug-nutrient interactions. While the majority of multivitamin supplements deliver the recommended dietary allowance (RDA), which is only enough to avoid vitamin deficiencies, Persona seeks to deliver science-backed therapeutic levels of vitamins and minerals that support optimal health.